The finance has allowed Banbury Print Lamination Limited to relocate to larger premises, purchase new machinery and create eight full-time jobs – allowing the firm to take on and deliver a number of key orders. Banbury Print Lamination offer a comprehensive print, lamination and PUR binding service. Since taking on the investment, the firm has seen its turnover soar, recording £55,000 of sales in the last two months. Matthew Morris, Managing Director of Banbury Print Lamination, said: “I’m really pleased with the growth Banbury Print Lamination has experienced since securing funding, which has exceeded all expectations. It was increased demand and growing order books that prompted us to source funding from MEIF and BCRS. The company secured £25,000 from MEIF WM Small Business Loans through fund manager BCRS Business Loans (BCRS), which offer loans from £25,000 to £150,000 to businesses based in the West Midlands. 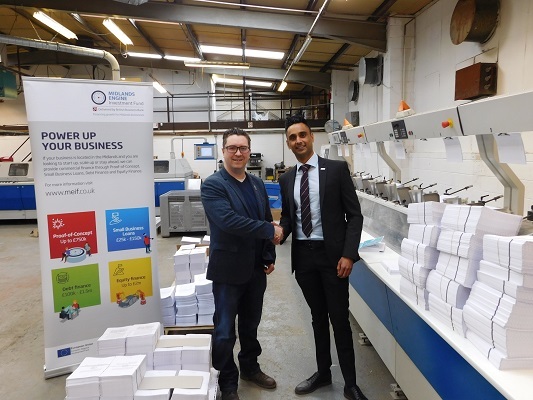 Osman Baz, Business Development Manager at BCRS Business Loans, said: “We are delighted to have supported the expansion of Banbury Print Lamination, helping it create eight new jobs and positively impacting the local economy. “With a raft of experience in the sector and a strong vision, we were confident in Matthew’s plans. Grant Peggie, Director at the British Business Bank, said:“Access to finance is often a barrier to growth for small businesses, with many boasting ambitious plans, but lacking the capital to move forward. To discover more about the MEIF small business loan fund in the West Midlands, visit www.bcrs.org.uk.